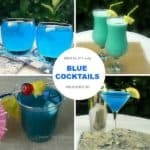 Blue Cocktails for Summer fun drinks, themed parties or for whenever ! Disclosure: Message intended for our readers 21+ only Blue Cocktails are so fun ! There is something very tropical about Blue, which might have to do with the ocean and white stretched out beaches.